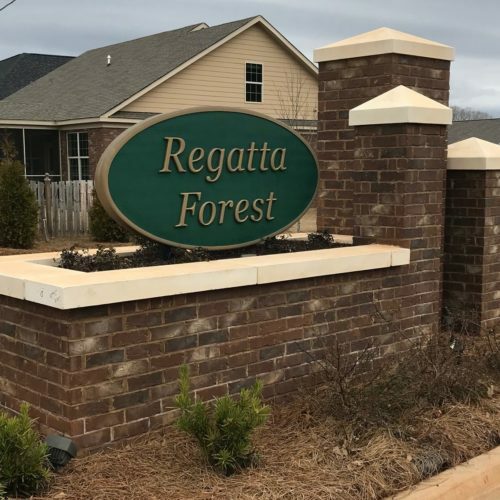 Regatta Forest is a 27-acre residential community located just outside the town limits of Irmo, SC (at the intersection of River Road and Regatta Road) on a large peninsula that extends deep into Lake Murray near the Lake Murray Dam. Regatta Forest was developed using sustainable, green community developmental concepts known as Low Impact Development (“LID”) Guidelines. The LID approach to site design reduces storm water impacts and preserves natural drainage systems and open space using bio-retention systems and vegetated swales. Through these methods, LID seeks to reduce the costs of expensive storm water management structures for municipalities and homeowner associations. Homebuilders within the planned community include Great Southern Homes and Fortress Builders, two of the largest builders in the Central Midlands of South Carolina. Homes are priced from the high $200’s to the mid $300’s and many custom options are available from each builder. Regatta Forest is served by the award-winning Lexington School District Five and is located within the Irmo Elementary, Irmo Middle and Irmo High school attendance areas.